In the space between words lies the connection, and in that connection is the power to transform, connect and build. The connecting the ANDs project is an evolving entity encompassing art, discussion and community building that spans the distances between us. We accomplish this in many ways, and are constantly learning, growing and figuring out new ways to connect across our local community and the globe. Here are some ways outreach is happening at Roots + Wings. Help support our connecting the ANDs community classes, camps and mentorships with our amazing partner - the AAAC! Your donation will be processed and sent to us by the Asheville Area Arts Council, our fiscal sponsor. You can also support scholarships for students attending our other programs at Roots + Wings: preschool, after-school, summer camps, etc. As we strive to create programming accessible to all. Find out more about our Grace Eaton Scholarship and help us also continue the legacy of one of our amazing instructors! We love our interns! We have opportnities in multiple avenues of Roots + Wings, with our outreach being one of them. Click here to visit our INTERNSHIP PAGE to learn how you could help us out at our various program locations. check out our outreach programs! Our Roots + Wings outreach team offers Community Classes as one more way to connect with our local community, offering space and time between groups of people that for one reason or another, do not get a chance to spend much time together. We work with numerous non-profit organizations to create opportunities, including Children First Communities in Schools, YWCA of Asheville, OpenDoors Asheville, Eliada, Arts for Life, Open Hearts and more. We also create opportunities for children from multiple organizations to come together for Creativity Camps. An example of a recent collaboration was with children from Arts For Life (art education for pediatric patients), Eliada (supporting high risk children and adolescents) and Roots + Wings. These camps offer opportunities to connect and inspire joy in each other through both individual and collaborative works. Like our other series, each of the participants receive a set of postcards of their collaborative work, with the simple goal that they will then send the postcards to friends and family - spreading our collective stories even further. Read about our GRACE EATON SCHOLARSHIP FUND that helps support our connecting the ANDs community classes and creativity camps! Collaborative Community Portraits can take many forms. They are collaborative works created by groups of people at private events, public events, family gatherings, festivals, staff retreats, weddings - you name it. We can use photography, collage, drawing, painting, stamping, writing, image transfers and more. Participants position and glue their ‘portrait’ into the provided background (either a large sheet of archival quality paper, or painted board). The provided background will have a layer of colored chalk already on it, ready to receive additional layers. Each Community Portrait is a real-time collaborative art work. The finished piece will reflect the interaction of attendees and the space in which the event is held. The finished work can be varnished, framed or photographed and printed. As always, the work will be professionally photographed and made into postcards for those involved to send out into the world to connect beyond their own community. The series of pieces was made into a postcard set and shared with each community that participated…. 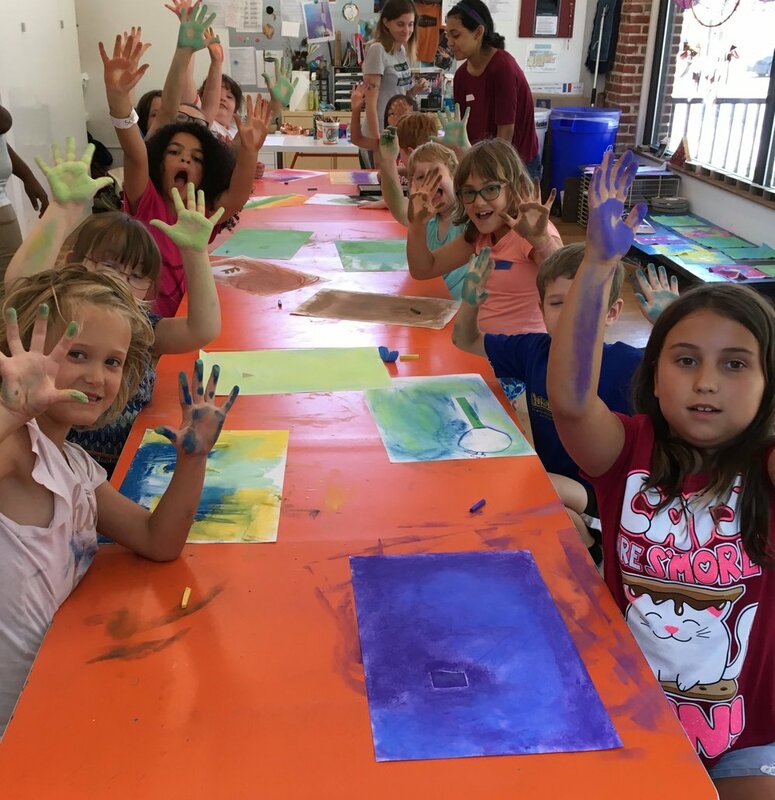 During the summer of 2018 we held a 4-part series of open discussion forums and community collaborative art making sessions at various locations in Asheville. Each session featured a guest speaker and topics include Racial Equity, LGBTQ Equality, Interfaith Connections, and Immigration Reform. Participants were invited to share, listen and create in a judgement-free zone. The resulting artworks serves as a reminder of how creative activity bridges gaps in experience, knowledge and understanding. This mixed media process-based project involves multiple sets of fifteen artworks traveling to destinations locally and around the globe. Ginger starts the process with a set of works that have one layer of chalk pastel and a few simple collage elements. She sends these pieces to communities around the world. Participants are invited to add something by drawing, painting, stamping or attaching a layer of their own story to the work. When the artworks finally return to Asheville they will be professionally photographed and reproduced as a set of postcards. Each community that participates will receive a set of fifteen postcards, with the simple goal that they will then send the postcards to friends and family - spreading our collective stories even further. During 2017-18 we shared a set of works with communities in Cuba, Singapore, and Australia. Layers were added by adults and kiddos from the community of Fieles a Jesus in Matanzas Cuba, middle school students from Singapore and a gathering of young adults at a music festival in Australia. The connecting the ANDs projects name (a thriving, multi-disciplinary adventure drawing together participants near and far) was originally developed by Ginger Huebner, our R+W Founding Director. She believes that understanding only comes through real connection. As a visual artist with a background in architecture and education, Ginger’s art practice thrives on dialogue. Her investigations have created a substantial body of work that examines the fragments of experience, place and circumstance that combine to create the essence of identity. Ginger’s architecture foundation - specifically the practice of working closely with clients in the creative process - and her training as an educator have steered her towards using her art practice as a conduit between communities, exploring and bridging the spaces between us. The Cuba, Singapore, Australia series was created into a set of postcards that were shared with each community that participated…. Learn more about Ginger Huebner - Artist, Educator, Collaborator, Consultant - and how her work weaves in and out from her studio to Roots + Wings and back.